Australian firm Bates Smart is to design a new Embassy of Australia for the US capital, replacing the building that the firm designed for the same purpose in 1964. Working with local practice KCCT, Bates Smart was announced as the winner of the competition for the embassy building last month. The firm now has the opportunity to supersede its current offices for the Australian ambassador, located on Washington DC's Embassy Row at 1601 Massachusetts Avenue – almost directly north of the White House. "It is with great pride that we have the opportunity to replace this building with the next generation of Bates Smart design," said the firm's director, Kristen Whittle. 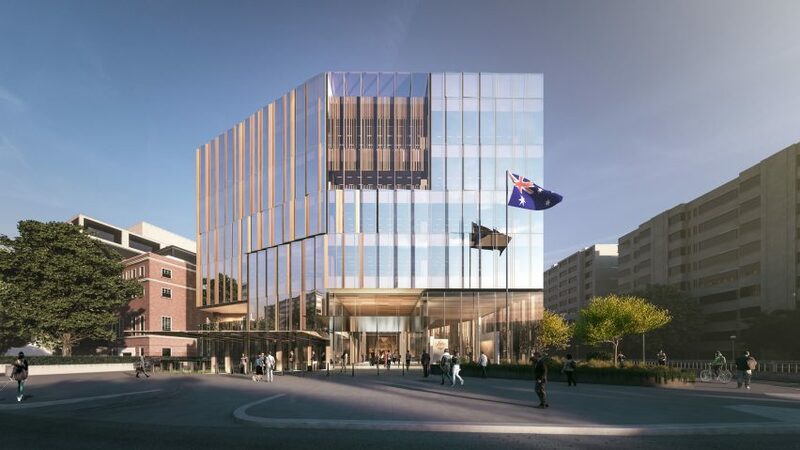 "The design of the new embassy has been inspired by the unique and beguiling beauty of the Australian landscape," she added. "The project has a refined and rich materiality which will make it stand out in Washington." Clad in vertical strips of glass, the building will feature a large glazed atrium designed to draw light into the centre of the expansive footprint. On the ground floor, a large open area will form the main entry into the building. This will lead to a sequence of exhibition gallery and spaces used for ceremonial and public functions. Surrounding the atrium on the upper levels will be flexible working areas. The architects have outlined a variety of features to improve the building's green credentials. These include a thermally efficient facade, a green roof covered in photovoltaics and a reliance on natural light where possible. "The highly sustainable design expresses the openness of Australian culture and the rich beauty of its landscape in a thoughtful plan respectful of the neighbourhood, the street edge, and the historic location at Scott Circle on axis with the White House," said KCCT principal John W Chapman. In January 2015, it was reported that the existing building's condition was deteriorating, and its exterior was covered in scaffolding as a safety precaution. The Australian government initially considered repairing the structure, but eventually ran a competition to design a replacement. Another of the country's embassies was recently completed by Denton Corker Marshall in Jakarta. Studio Gang has been chosen to design a new US embassy in Brasilia, while America's KieranTimberlake-designed outpost in London is currently under construction. Renderings courtesy of Bates Smart.